“Come Here by the Waters” A Baptismal Hymn | When I Survey . . .
Come here by the waters, come bring us your child. We’ll call on God’s Spirit, so loving and wild. These people and parents will speak their firm vow. This child full of blessing belongs to Christ now. And lead to a life filled with service and praise. Through life’s many changes you’ll watch her with care. That we may be faithful in every new hour. And bless these dear children with grace from above. For blessings and graces that reach far and wide. Both now and forever, and far beyond time. 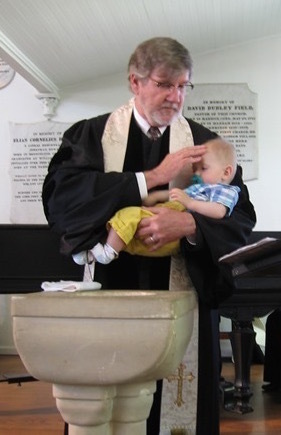 This hymn of mine was commissioned earlier this year by Eileen Hunt, former Minister of Music at Green’s Farms Congregational Church, UCC, in Westport, CT, who was looking for a new baptismal hymn. I chose the tune Cradle Song, which is the tune the British sing Away in A Manger to, because of its resonances with infancy, and because it is not so familiar that Americans will hear Away in a Manger in their ears when they sing it. Below you will find reproducible PDF’s for both a melody only and a harmony version. The tune was written by William James Kirkpatrick and the harmony by the estimable Ralph Vaughn Williams. One suggestion is to sing the first two verses just before the act of baptism and the last two just after. This entry was posted in Baptism, Christian faith, Church, Faith, Holy, hymn, hymns, worship and tagged Baptism, hymn, liturgy. Bookmark the permalink. Amen to Gail! Many thanks for your continuing witness.